There is no coast in Cologne, but there is the Rhine river, running right through the middle of the city. We decided to do a circular route. We would set off south along the west bank, crossing the river at Südbrücke. We would then go north for a few miles and cross back over via the city’s cable car, before turning south again to end back at our hotel. Südbrücke itself is a rail bridge with pedestrian footpaths to either side. Cologne is as an industrial city (due in no small part to its position on the Rhine), yet on the west bank we found little evidence of industry. 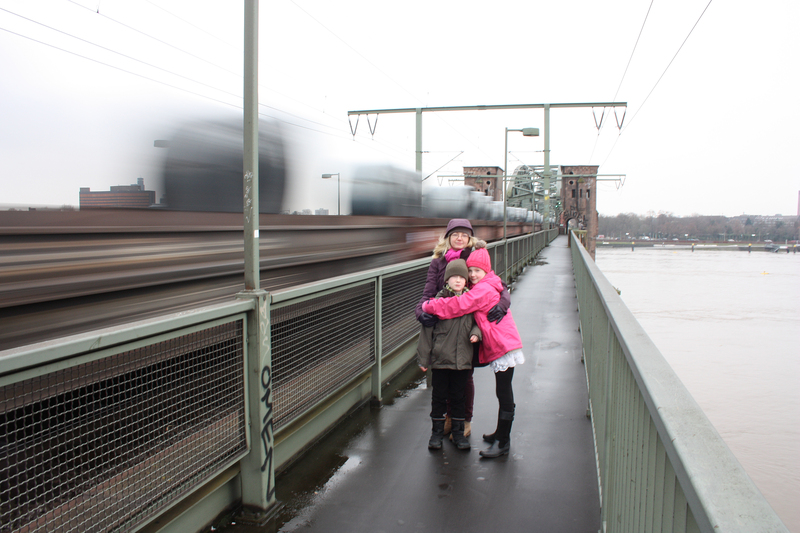 The number of goods trains we saw crossing Südbrücke proved that heavy industry existed – we just had to find it. It may seem strange, wanting to look at industry when on holiday, but if we were in an industrial city we felt it only right that we see some industry. As we crossed, a train carrying massive reels of sheet metal shook the whole bridge as it passed – we were on the right track! 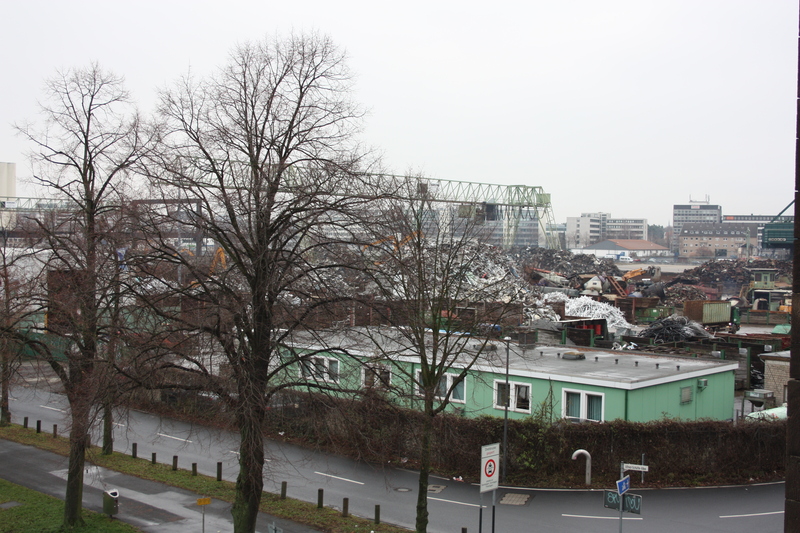 There, at the far end of the bridge, was the view we craved – a massive scrap metal yard. We didn’t spend too long looking at the crane hauling scrap; something else grabbed our attention. Fixed to the metal mesh fencing of the bridge were padlocks. On closer inspection we saw that each had two names and a date on them. What were they? A passing thought flitted through my mind: Südbrücke was a suicide bridge, and these padlocks had been clamped to the metalwork as small markers, left by lovers who then leaped from the bridge into the waters of the Rhine, to be sucked down into the final embrace of the icy currents and never seen again. It was, as I say, only a fleeting thought; sense and reason kicked in quite quickly. These padlocks had been left here to declare a permanent and everlasting love. They were “love padlocks” I found out later. We had never come across them before. But I suspect the lovers themselves don’t think about these sorts of things. They only want to declare their love for all eternity. They had even been spray painted the padlocks red for love, along with bits of the surrounding fence which had been caught in a frenzied emotional crossfire! I was quite taken with this public declaration. If only we had a padlock with us I would have stenciled my name and my wife’s name on it and locked it onto the fence in the name of everlasting love. (I mentioned this to my wife, but she decided the padlock in question should stay firmly in place on my chastity belt). The padlocks were not the only things spray painted here. 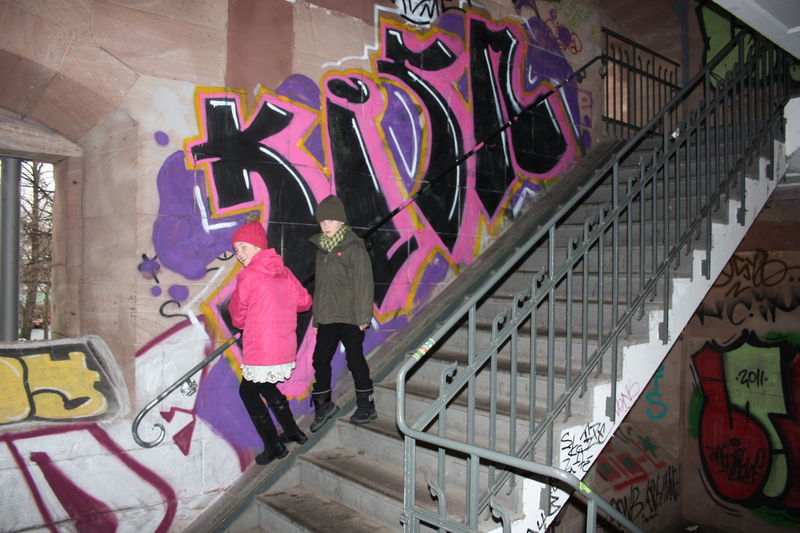 The enclosed staircase at the other end of the bridge was liberally doused with spray paint of all colours. I wish to add that although the graffiti in the next picture seems to say “KIDZ” or something similar, it was not my kids who did this, although you’d be forgiven for thinking they did from the guilty looks on their faces. Cologne, it must be said, has its fair share of graffiti. It is not to be found everywhere, but where it is found there is lots of it. We left Südbrücke and reached the east bank of the Rhine. Our children were at this point the farthest east they had ever been in their lives. 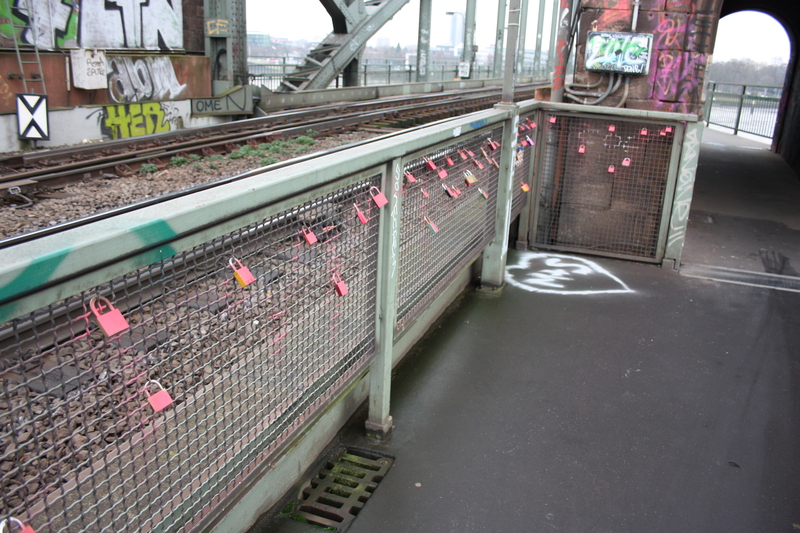 This entry was posted in Germany and tagged cologne, grafitti, love, love padlocks, Rhine, Südbrücke, travel, walking. Bookmark the permalink.